Cairo's Tahrir Square is once more in the news: revolution and counter-revolution, protest and put-down. But some issues never capture the headlines: for instance, did you know that at least 13 villas and public buildings around the square (including the present Swiss, German, Canadian, Russian, US, Korean, Bahraini and Algerian embassies) were once the residences of wealthy Jews - properties seized by the Egyptian state? Together with humbler properties owned by Egypt's 80,000-strong Jewish community - itself now on the verge of extinction - these grand residences stand as silent witnesses to mass dispossession. The Jewish owners never received compensation and were summarily expelled in the 1950s. A feature about the Tahrir Square embassies appeared in the Hebrew press on the day that, in order to force Israel to make concessions for peace, the EU announced it was banning co-operation with Israeli institutions that operate beyond the 'pre-1967 borders'  the West Bank, East Jerusalem and the Golan Heights. The EU regards these territories as 'Arab land'. With its anti-settlement policy, the EU is sending a clear signal that it is acceptable for the Arab states, goaded by the Palestinian leadership, to 'ethnically cleanse' the Jewish population of the so-called Palestinian territories, the Middle East and North Africa, but that Jews living a few meters beyond the 1948 armistice lines are obstacles to peace. Like the Palestinians, the EU assumes that the West Bank, East Jerusalem and the Golan Heights are 'Arab land.' But nothing is ever that simple in the Middle East. Land ownership is a tangled web, although that's a point not often made by the Israeli government. The Golan Heights are almost universally considered 'Syrian' territory and yet the Jewish National Fund lays claim to 73,974 dunams in southern Syria. The earliest purchase was made in the 1880s. Similarly, land ownership in Jerusalem and the 'West Bank' is far more complex than the EU thinks. The 'Jewish settlements' north of Jerusalem, Atarot and Neve Yaakov, were evacuated in 1948. Mount Scopus - technically in 'Arab' East Jerusalem - remained a Jewish enclave in Jordanian-controlled territory. It is also little known that hundreds of thousands of Arab squatters in 'Arab East Jerusalem' live on land still owned by the Jewish National Fund. The JNF purchased hundreds of individual parcels of land in and around Jerusalem during the 1920s, 1930s and 1940s. In 1948, on one of these parcels the UN built the Kalandia refugee camp. The Deheishe refugee camp south of Bethlehem was also built on JNF land. In the 1920s and 30s Iraqi and Iranian Jews queued up to buy parcels of JNF land; after the 1948 war, they were cut off from their purchases when these came under Jordanian rule, as Gil Zohar explained in his 2007 Jerusalem Post piece. In total 145,976 dunams (I dunam = 1,000 sq. m) of Jewish land is said to have come under Jordanian control. (Jewish property claims against Arab countries by Michael Fischbach, p 85). During the 1920s and 30s the 'Agudat HaDayarim' Jewish Cooperative Society was established in Jerusalem in order to create Jewish neighbourhoods outside the Old City. The Society had over 210 members, from all walks of life and ethnic backgrounds - including Persian, Iraqi and Yemenite Jews. In 1928 the Aguda purchased 598 dunams of land on the city outskirts in Abu Dis in order to build a 'Garden Community' (homes with agricultural plots). Although it acquired a legal title to the area, the Arab revolts of 1929 and 1936-9 prevented the Aguda from establishing the new community. The War of Independence resulted in the Jewish-owned lands in Abu Dis coming under the control of the Jordanian Custodian of Enemy Property. Another 16,684.421 dunams of Jewish land in the rural West Bank - including the Gush Etzion settlements, land between Nablus, Jenin and Tulkarm, and in Bethlehem and Hebron - were seized by the Jordanians after 1948. Before it fell to the Arab Legion in 1948, Jerusalem had a Jewish majority. The first refugees from eastern Jerusalem were Jews from the Shimon Hatzaddik quarter - the site of the tomb of Simon the High Priest. The Old City of Jerusalem became 'judenrein' as thousands of Jews were expelled, leaving their property behind. The Old City was ransacked and some 58 synagogues were destroyed during the 19-year Jordanian occupation. Jews were banned from their holiest places. There is a respectable body of opinion which argues that most Israeli settlements are legal. 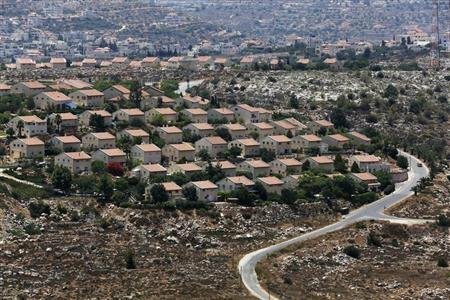 Even if Israel were to agree that the Jewish settlements stigmatized by the EU are illegal under international law, the proportion of land 'built on Arab land' in the West Bank represents a tiny fraction of the Jewish-owned land abandoned or seized as a matter of deliberate policy in Arab countries. The status quo represents an exchange far more favourable to Arabs than to Jews. According to economist Sidney Zabludoff, the Jewish refugees  75 percent of whom resettled in Israel - lost assets worth twice as much as those abandoned by Palestinian refugees. On the macro-level, the World Organization of Jews from Arab Countries estimates that Jews living in Arab countries owned some 100,000 sq km of deeded property, equivalent to four or five times the size of Israel itself. Many cities in the 'Arab' Middle East and North Africa had large Jewish populations. Baghdad was a quarter Jewish. Within a generation, the Jewish population of the Arab world will have been 'cleansed' out of existence. Evidently, private ownership of property does not equate to sovereignty. But many people  the EU included - assume that areas inhabited in Jerusalem and the 'West Bank' by a majority of Arabs - regardless of whether they established that majority at the expense of Jews - should naturally come under Arab sovereignty. Organisations like J-Street and Yachad are willing to fight for Arab squatters' rights; you would be hard-pressed to find any human rights group or NGO prepared to campaign for Jewish property rights. The suggestion is never considered that the attacking parties in the 1967 war - Syria and Jordan - should be made to forfeit territory as the price for their aggression. No Arab state has been held to account for 'ethnically cleansing' their innocent Jewish citizens whom they branded, from 1948 onwards, as 'members of the minority of Palestine'. Instead, the Arab states have pocketed the spoils. It goes without saying that no Arab government has paid out any compensation for lost Jewish property. Israel is expected to make all the concessions. East Jerusalem was annexed to Israel; some Jews have recovered their properties, and settlements predating 1948 have been re-established since the 'West Bank' came under Israeli control. But those Jews who purchased parcels of land in East Jerusalem and its periphery have not been allowed to recover lands purchased from the JNF. The reason is that these come under the jurisdiction of the 'Jordanian Custodian for Enemy Property' . The irony is that the Sephardi and Mizrahi Jews among them are screwed twice over: by the Arab states, who forced them to become refugees and dispossessed them of their original dwellings in Arab countries - be these mansions in Tahrir Square or rather more modest abodes ; and by Israel, which, in compliance with international law, will not, as a general rule, allow Jewish-owned lands beyond the Green Line to revert to their original owners until a final peace settlement is signed. In all the discussion of 'Jewish settlements the international community has a decontextualised and distorted idea of just who has dispossessed whom - and the Israeli government is not exactly helping to enlighten them. While I agree with the author's comments, I must point out that the JNF could not have purchased land in the 1880's; it was not established until 1901. The land was most probably bought by private individuals in the 1880s and the rights to them sold to the JNF at a later date. It should be pointed out that other Zionist settlement organisations were also buying land in Syria: Bet (Bnei) Yehuda and the Palestine Land Development Co. Baron Edmond de Rothschild bought a large area in the Hawran region from 1891.